Status: Rare regular spring migrant west, accidental central. Rare regular fall migrant west. Uncommon regular breeder northwest. Documentation: Recording: 9 Jul 1991 Sowbelly Canyon, Sioux Co (Grenon 1991). Taxonomy: There are two subspecies recognized, hellmayri from southern British Columbia and southern Alberta south to northeast California and western Texas, and occidentalis of central and southern Mexico (Pyle 1997, Gill and Donsker 2017). Nebraska birds are presumed hellmayri. 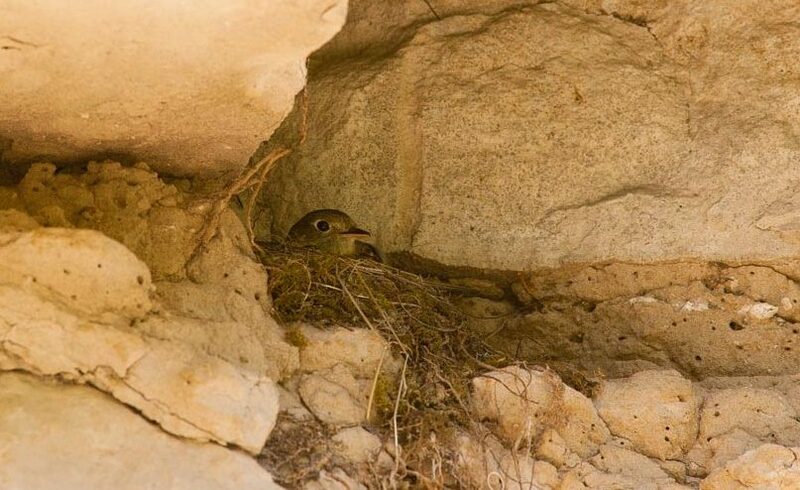 This account includes Nebraska reports of “Western” Flycatcher prior to 1988, when it was concluded that two species were involved, Pacific-slope Flycatcher (E. difficilis) and Cordilleran Flycatcher (Johnson and Marten 1988). These species are difficult to identify in the field; Pacific-slope Flycatcher is not expected to occur in Nebraska but see Comments. Changes Since 2000: Cordilleran Flycatcher has expanded its Nebraska breeding range eastward and now occupies the entire Pine Ridge (Mollhoff 2016). It has nested recently in the Wildcat Hills, Scotts Bluff Co (see Summer). An earlier date is 6 May 1994 Scotts Bluff Co, and later dates are 7 Jun 2009 Gordon Cem, Sheridan Co, 11 Jun 1966 McPherson Co, 12 Jun 2010 Crescent L NWR, Garden Co and 19 Jun 2010 Wright’s Gap, Morrill Co. There is one report east of the Panhandle; one was at Valentine NWR 20 May 2006. Reports of migrant Cordilleran Flycatchers in spring are rare. It is also rare on the Colorado plains east of the Rockies, especially when compared to Dusky and Hammond’s Flycatchers (Weske 1976). Andrews et al (2002) list no spring banding records at Barr Lake, Colorado. Of 24 Nebraska reports away from the breeding range, 16 are since 2000, probably as observers improve their identification skills for Empidonax flycatchers, and the Nebraska breeding range has expanded eastward and southward (see Summer). Summer: Cordilleran Flycatcher is known to occur regularly as a breeder only in Pine Ridge canyons, where it is found in riparian locations with steep cliffs and shaded shrubby vegetation. It probably arrived in Nebraska relatively recently, as it was not listed by Bruner et al (1904); the first record for Nebraska was as recent as 6 Sep 1961 (Brashear 1962, Gates 1962). It has bred in the Black Hills of South Dakota since at least 1948 (Tallman et al 2002). The observation by Rosche (1982) of a singing male in Sowbelly Canyon, Sioux Co 4 Jul 1973 is the first indication of breeding in Nebraska. The following year, on 17 Jul 1974, Rosche (1982) discovered a nest with four young in Sowbelly Canyon; this was at the same location as the 1973 sighting. Cordilleran Flycatchers have been reported from Sowbelly Canyon most summers since, in the period 28 May-5 Aug. Nearby Monroe Canyon has multiple individuals also; 11 were counted there 20 Jul 2000. Reports 24 Jun 1996 in the Wood Reserve, Sioux Co (Silcock and Jorgensen 1996) and 31 May 1997 in Smiley Canyon, Sioux Co and East Hat Creek Canyon, Dawes Co the same day (Silcock and Jorgensen 1997), were at locations where nesting might have occurred. Recent years have seen expansion eastward of this species; it probably breeds throughout the Pine Ridge, east to Metcalf WMA, Sheridan Co where nest building was observed 20 Jul 2011 (Wayne Mollhoff, personal communication), the easternmost breeding location to date. Recent reports from Sheridan Co are from Beaver Creek 21 May 2012 and Whiteclay 28 Jun 2015. The only nesting records away from the Pine Ridge are in the Wildcat Hills, Scotts Bluff Co; breeding occurred near the Nature Center 24 Jun 2003; nestlings were thought to be present 3 Jul. A single was at the site 10 Jun 2009 and another was calling there 27 Jul 2014. As in spring, reports away from the breeding range in fall are rare. Earlier dates are 9 Aug 1995 Garden Co (Silcock 1995) and extreme southeast Sioux Co 18 Aug 2007, and the only later date is surprisingly late, one banded at Wildcat Hills NC, Scotts Bluff Co 10 Oct 2008. Reports with tangible evidence, banded and/or photographed (but see Comments), are 24-26 Aug 2002 juvenile Bushnell Cemetery, Kimball Co, 28 Aug-8 Sep 1979 Garden Co, 28 Aug and 7 Sep 2015 Chadron SP, Dawes Co, 30 Aug 2014 Chadron SP, 6 Sep 2012 Gering Cemetery, Scotts Bluff Co, 9 Sep 1978 Garden Co, 10 Sep 2009 Chadron SP, and 13 Sep 2011 Chadron SP. Comments: Although Pacific-Slope Flycatcher may not be expected in Nebraska, Tony Leukering (personal communication) pointed out that, like Cassin’s Vireo, which is more common in fall on the Colorado Plains than Plumbeous Vireo, “it is too likely that Pacific-slope could be regular” also; this led Leukering to state: “I’m not even willing to identify silent migrant “Westerns”. Photograph (top) of a Cordilleran Flycatcher on a nest in Sowbelly Canyon 9 Jul 2008 courtesy of NEBRASKALAND/Nebraska Game and Parks Commission. Brashear, J. 1962. Excerpts from Letters. NBR 30: 14. Gates, D. 1962. Fourth Report of Fall Records. NBR 30: 41-49. Johnson, N.K., and J.A. Marten. 1988. Evolutionary genetics of Flycatchers. II. Differentiation in the Empidonax difficilis group. Auk 105: 177-191. Silcock, W.R. 1995. Fall Field Report, August-November 1995. NBR 63: 94-114. Silcock, W.R., and J.G. Jorgensen. 1996. Summer Field Report, June-July 1996. NBR 64: 90-103. Silcock, W.R., and J.G. Jorgensen. 1997. Spring Field Report, March-May 1997. NBR 65: 74-99. Weske, J.S. 1976. Western Flycatcher in Oklahoma. Auk 93: 655-656.